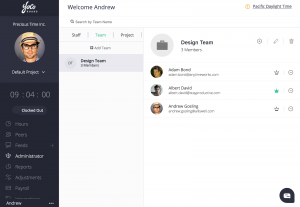 Asana is a popular project management software that lets teams plan and add tasks along for optimum time management. 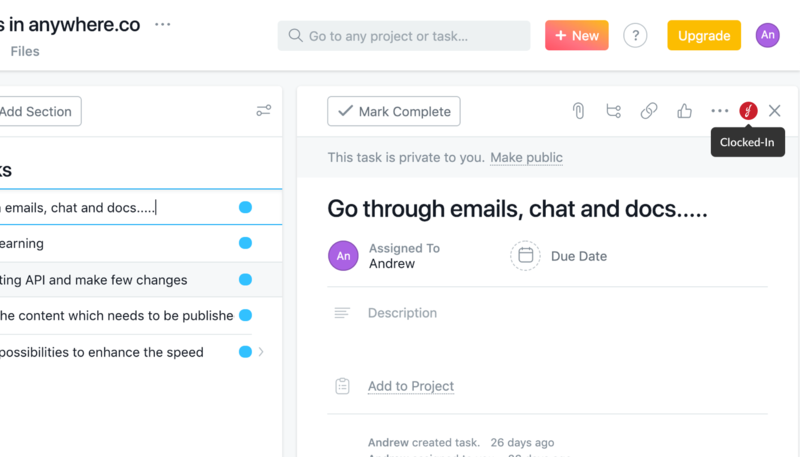 Asana features a progress board that displays your tasks and projects, giving your workflow more transparency and gives you the progress with a glimpse. 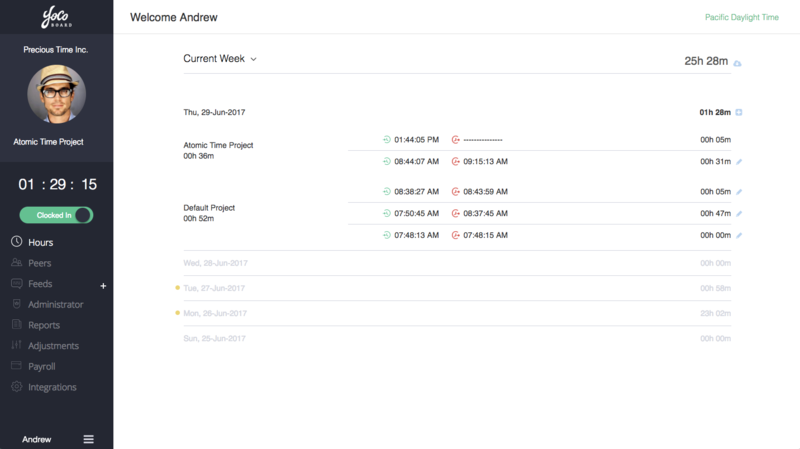 The Asana – YoCoBoard integration gives you the option to time your work hours spent on your tasks without leaving Asana. Let’s look at the integration setup. 1. From inside your YoCoBoard dashboard, select Integrations from the list in the sleek sidebar. 2. 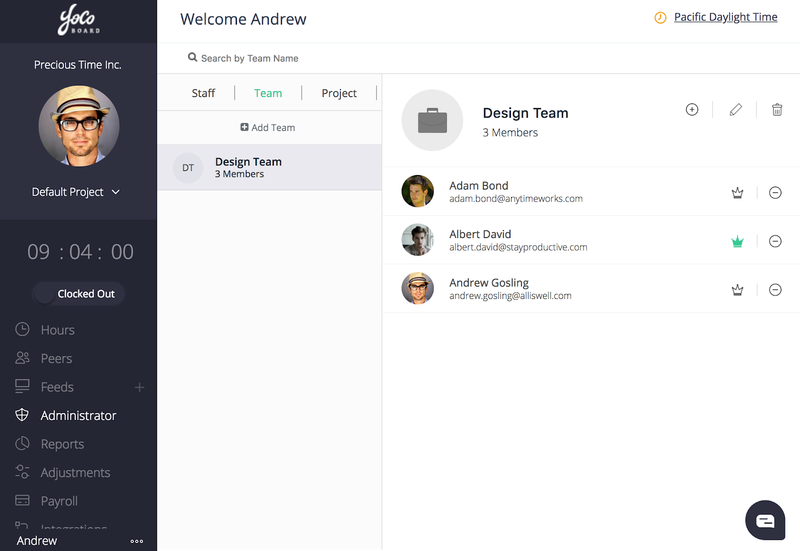 Choose the Asana integration card from the list and click on it. In the tab that opens, go through the integration steps carefully. 3. 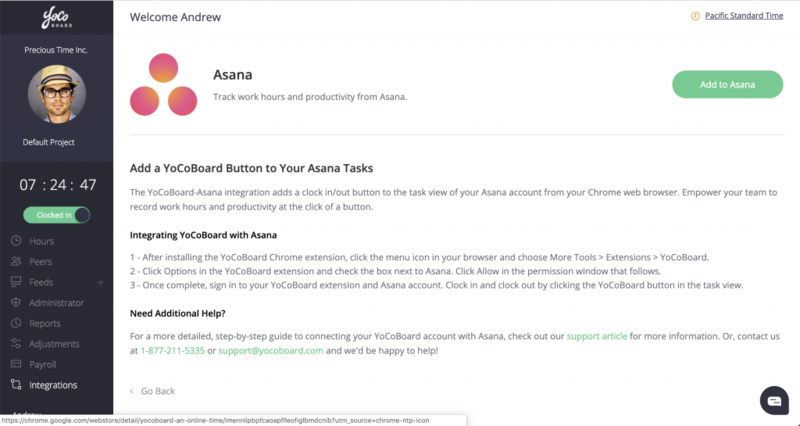 To proceed with the Asana – YoCoBoard integration, click the Add to Asana Button at the top. 4. You will be redirected to YoCoBoard chrome extension page. Click Add to Chrome at the top corner to proceed with the installation. 5. Upon clicking a pop-up requesting permission access will open up at the top. Click Add Extension to let YoCoBoard track your work hours from Asana. 6. After successful installation, an update message will be displayed at the top of the web-page. Now navigate to the menu icon (vertical ellipsis) on your browser and select > More Tools > Extensions. 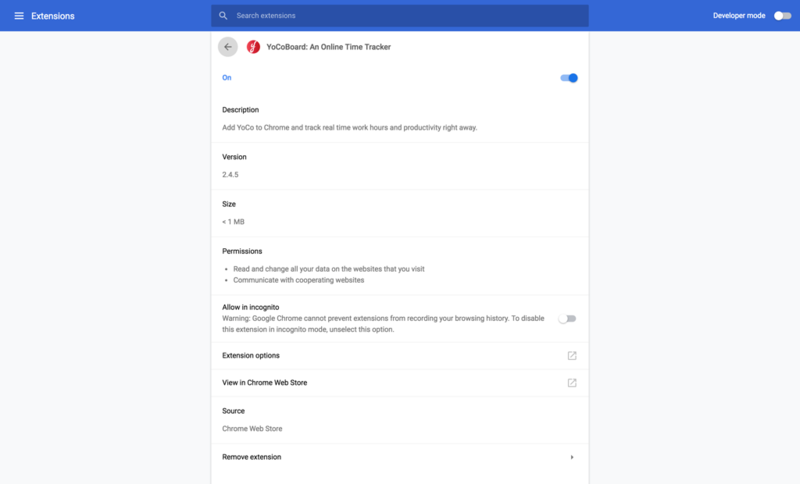 This will give you the list of all extensions enabled on your Chrome browser. Under the YoCoBoard extension, click Details. In the window that opens click on Extension options. Tick the Asana check-box pop-up that opens. Now sign-in to your Asana App. Select any task you are working on and in the YoCoBoard widget and click to start tracking hours. Your time entry will be recorded in the YoCoBoard app along with the task description. 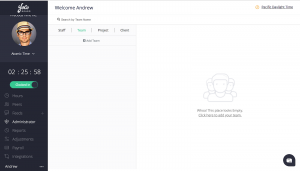 You can create teams in YoCoBoard to group members who work in the same departments. Creating teams helps you to organize people making it easy for new-joinees to learn who-is-who. From inside your account, navigate to the sidebar on the left and click Administrator. Click the Team tab and select +Add Team to proceed. Enter the team name and start adding members to the team by choosing them from the provided list. Note: Only members who are part of your organization in YoCoBoard will be listed. If you cannot find a staff member, you can invite them to join your organization on YoCoBoard. Once you finalize all the members, click the Save button. Once a team is created, you can update the name by clicking the edit icon next to the team’s name. You can delete members by clicking the encircled – ( minus) symbol that appears next to the team member. You can appoint one of the members of the team as a Team Owner. First, click the team name to view members in the team. Next, click the crown icon next to the name of a member to mark them as an admin. Choose confirm in the pop-up that opens. Note: Each team can have only one Team Owner. You can swap ownership from one member to another by clicking the crown icon. Start tracking the work hours spent inside Trello using YoCoBoard. Trello is a collaborative project management software that helps teams create a comprehensive breakdown of their working itinerary on a team board, and empowers team members to pick tasks, assign tasks to others, add a deadline to projects and track their progress. 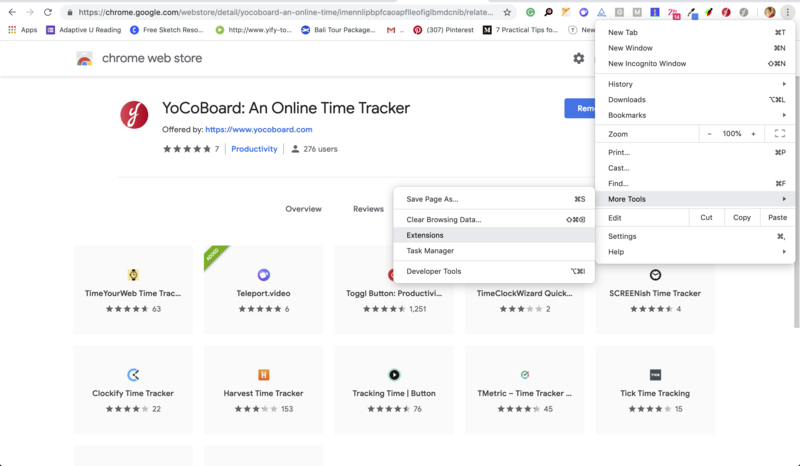 The YoCoBoard-Trello integration is an augmented feature of the YoCoBoard Chrome extension that enabled your team to track work spent inside Trello, when launched from your Chrome web browser. 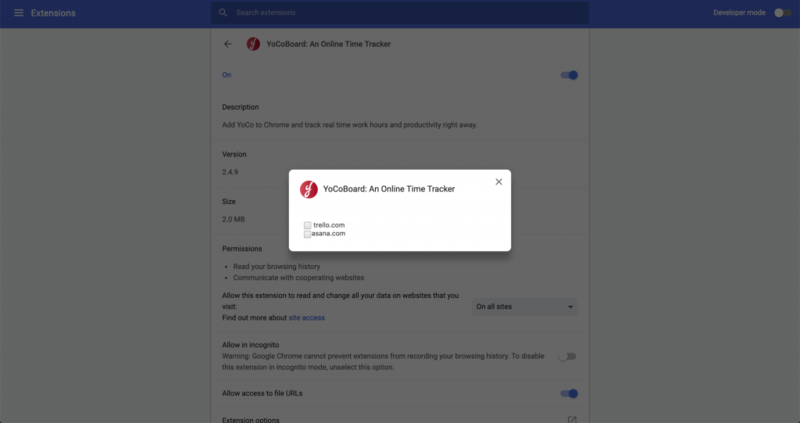 The YoCoBoard Chrome extension integrates with your Chrome browser and a Trello account. 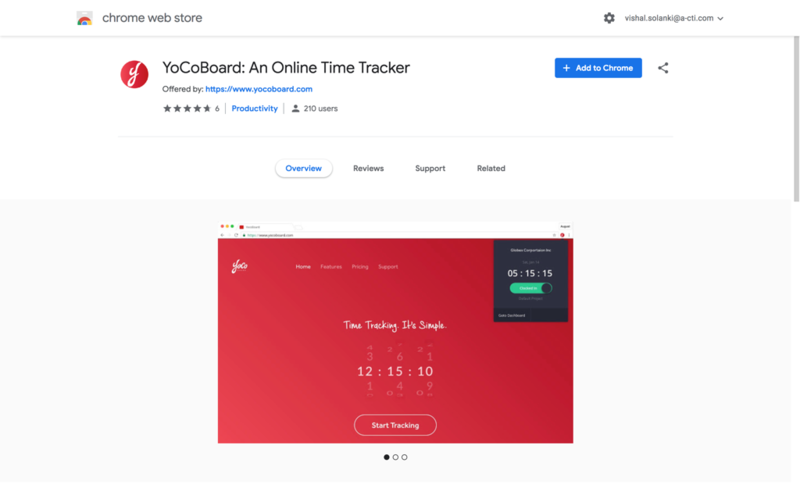 To add the YoCoBoard extension to your browser, click here. 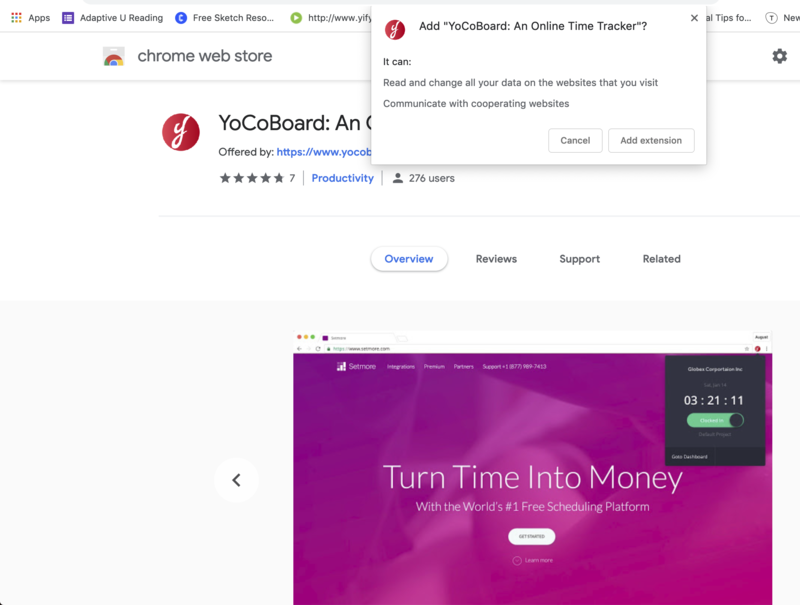 To get the chrome extension, go to Chrome web store and search for Yocoboard. Now click the Add to Chrome button at the right corner to proceed to install the extension. Upon clicking, an approval pop-up will open at the top of the page requesting your permission. 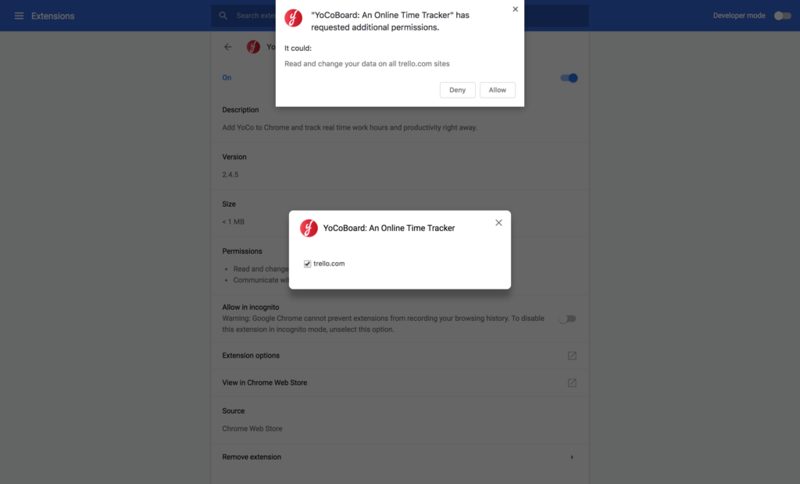 Click Add Extension to give consent for YocoBoard to track your work hours. After this approval, a pop-up will appear in the top to confirm the installation of the extension to your Chrome. After adding the YoCoBoard Chrome extension, click the menu icon on your browser and choose More Tools > Extensions. In the window that opens click on Extension options. Tick the Trello check-box pop-up that opens. A confirmation pop-up will open at the top requesting you to give permission to YocoBoard. Click Allow button to proceed with the process. Next, sign in to you YoCoBoard account from the YoCoBoard Chrome extension. Next, sign in to your Trello account or reload if you are already in a session. Click a card to open card details, where you will now find a button which, on clicking, will enable you to clock in. Once clocked in, the button will change to a Clock Out button, and clicking it will clock you out of the session on the widget and also complete the shift in the YoCoBoard web app. For a team member who did not clock out of the previous card, clicking the Clock In button in another card will end the previous session that was already running and start a new session. 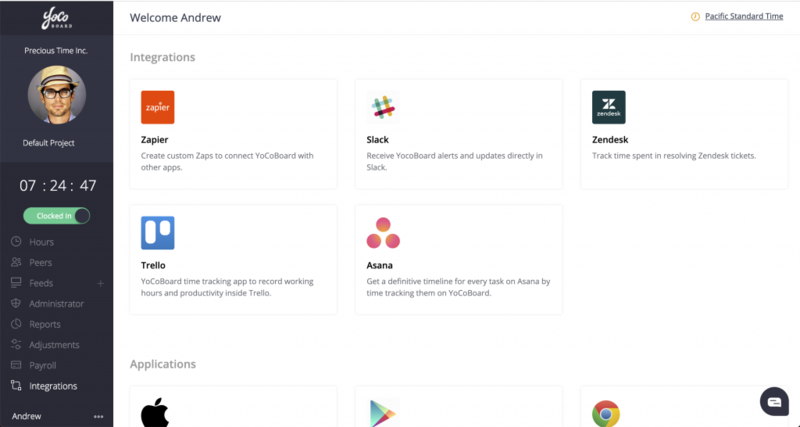 Zendesk is a popular customer relationship management software specializing in helpdesk support with a focus on resolving customer issues and questions via tickets. 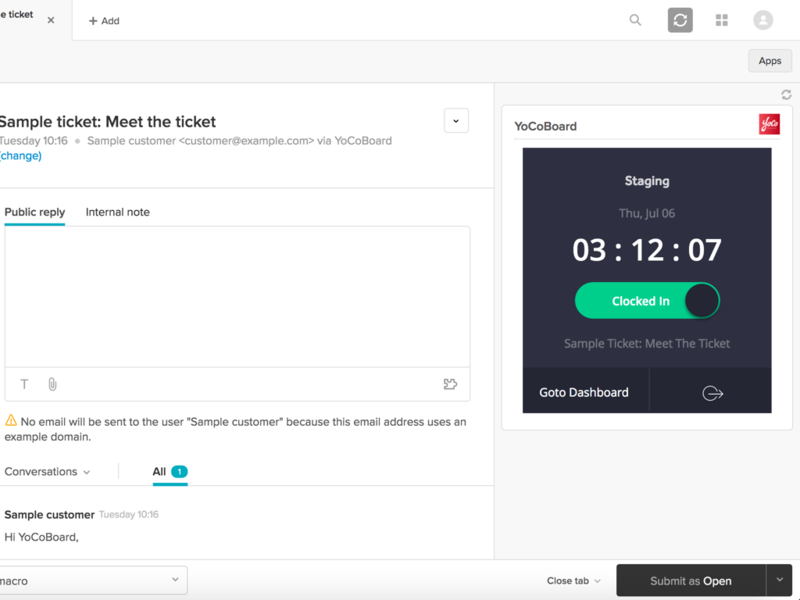 With the YoCoBoard-Zendesk Integration, you can add a YoCoBoard widget to your Zendesk Dashboard to clock the time that your agents spend in resolving tickets. A YoCoBoard account and a Zendesk account. If you don’t already have a YoCoBoard account, click here to get started. 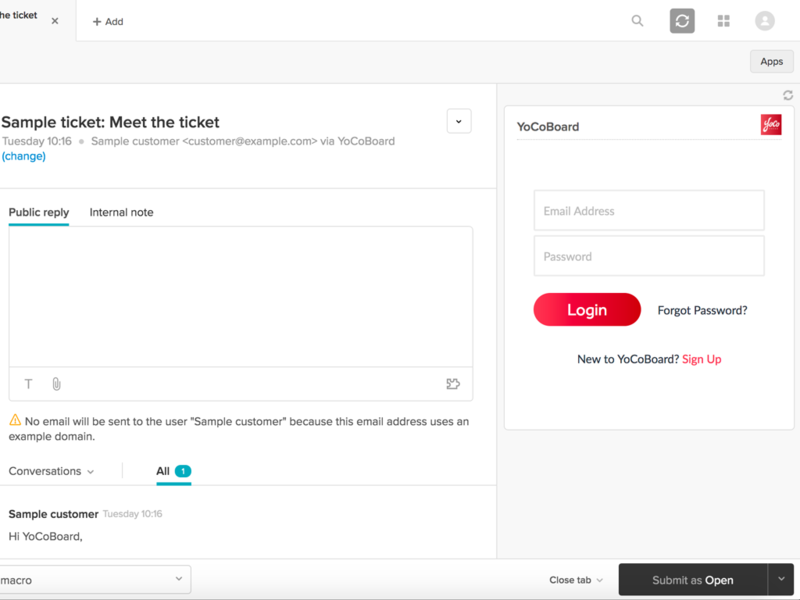 From inside your YoCoBoard web app’s dashboard, click on Integrations and choose the Zendesk integration card. In the Zendesk details menu, click the Add YoCo Widget button. 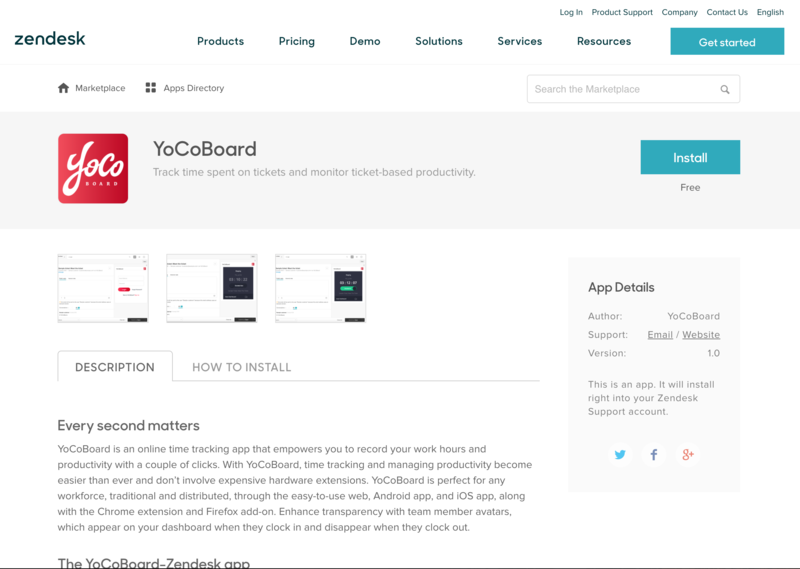 This will take you to the YoCoBoard app listing in the Zendesk App directory. Click the Install Button. In the Zendesk Sign in window, input the name of your Zendesk account and click the Log In button. Next, enter the email address and password combination and then click the Sign In button to complete the installation. 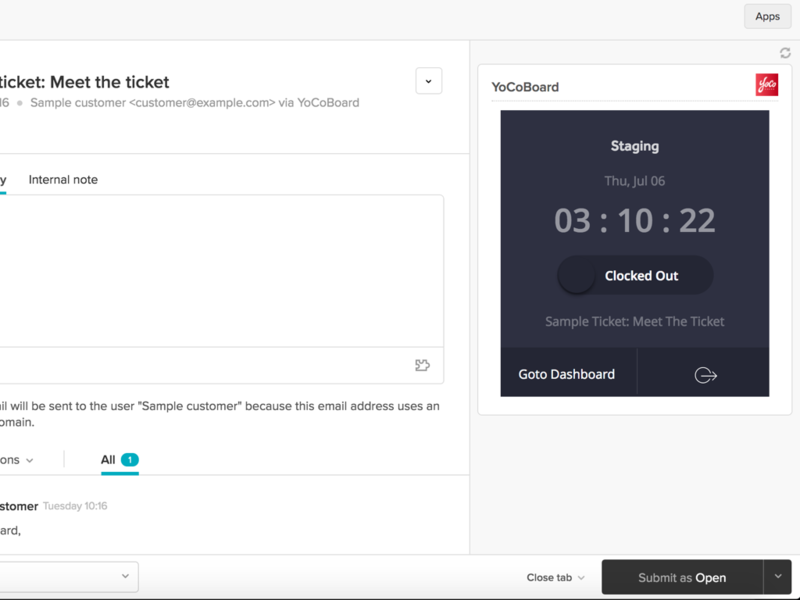 When working on resolving customer tickets, the YoCoBoard widget will appear in the right hand sidebar. Agents will have to input their username and password, and then click the Log In button. The widget will not contain ticket-specific details and agents can clock in and clock out to record the time they spend working on that ticket. If you have questions and need further assistance, please write to our support and we’d be happy to help! Sometime you need to edit a time entry, whether you created it by clocking in and out with the button or created it manually. To edit an existing time entry, start on the Hours page. Click the pencil icon on the right side of the line you want to edit. In the window that pops up, you’ll see the info for the entry as it stands now. You can change the start time, end time, project or any other field you see there. When you’ve entered the updated information, click Save. In the gif below, we’ll see how to change the clock-out time for an existing entry and add a description for the change. Sometimes, you might need to add a time entry manually rather than clocking in and out. For example, may be you forgot to clock in one day. To add a time entry, select the day for which you need to add the entry. Click the plus icon, at the right side of that day’s line. In the window that pops up, add the start and end times for the entry, the project you worked on, and a description. Your entry will show as Pending. The administrator of your account will review and approve the entry to make it official. 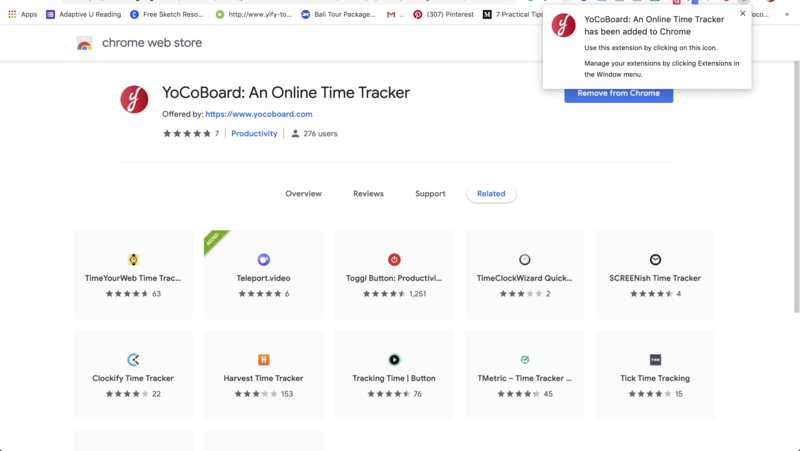 The hours you’ve spent clocked in on YoCoBoard are displayed on the Hours page. There you’ll see your hours for the current week by default, but you can also check the previous week, the current month, or any custom date range you choose. Each entry is displayed on its own line, and is independently editable. In addition you’ll see the total time for each day. So, you might see an entry for four hours you worked in the morning, and another entry for another four hours you worked in the afternoon. How to see who’s clocked in? The Peers option on the main menu lets you see which members of your team are clocked in. You can see your team members in grid, list or map view. As an administrator, you can clock them out or adjust their time entry. 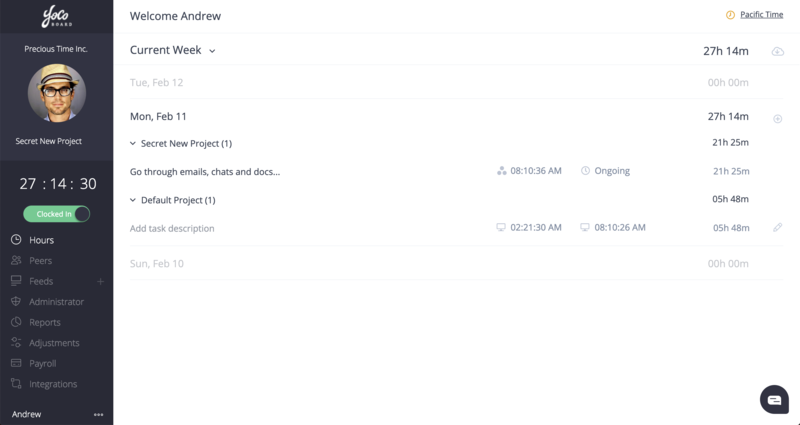 YoCoBoard Feeds are quick status updates you and your team can use to share what you’re working on. To add a new entry to your feed, just click the plus (+) icon next to the Feeds option in the main menu. You’ll see a box where you can type your feed. Click Post to share it with your team. To see all your team members’ feeds, go to the Feeds tab. You’ll see everyone’s feeds in reverse chronological order, with the most recent on top. To see just one person’s updates, select them from the list. 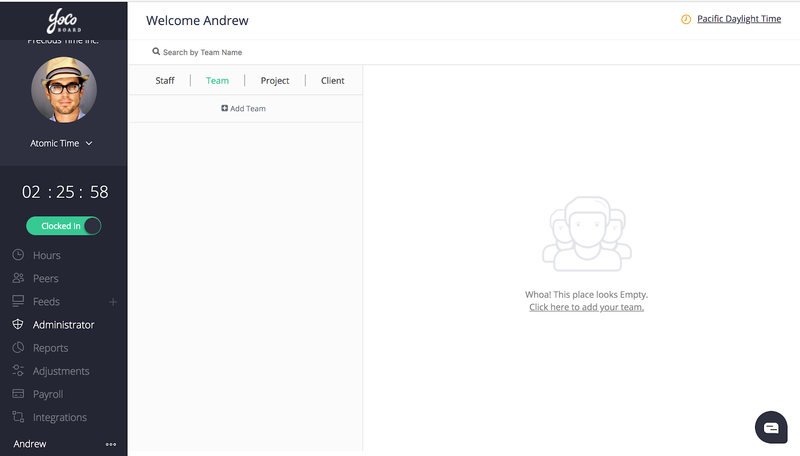 YoCoBoard gives you two ways to add team members to a project. 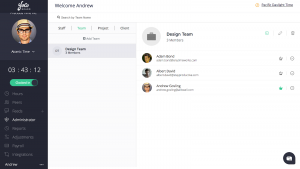 First, let’s look at adding team members to a project from the team member’s profile. Choose Administrator from the main menu. By default you’ll see a list of your staff members. Click on the person you’d like to add to a project. You’ll see that person’s profile pop up on the right side of the screen. Choose Projects from the menu in the profile. You’ll see the projects that person is currently assigned to. 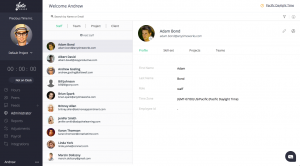 You can then choose Assign to Existing Project(s) to add the person to another project. When you click on Assign to Existing Project(s) you’ll see the projects you’ve created on your account. The ones that the person is already assigned to will be lighter color, since you can’t add them twice. Choose the project to which you want to add the person and click on the plus (+) icon for that project. In the gif below, we’ll add Karan Thomson to our “Secret New Project“. The second way to add team members to a project is from the Project itself. Start on the Administrator tab in the main menu, and then select Project. You’ll see all the projects on your account listed. Choose the project to which you want to add members. You’ll see the members listed to the right. Choose the plus (+) icon to add people. Check the boxes next to any staff you’d like to add and click Save. In the git below, we’ll add a few more team members to our “Secret New Project”.